The LSM303DLM combines a digital 3-axis accelerometer and 3-axis magnetometer into a single package that is ideal for making a tilt-compensated compass. The six independent readings, whose sensitivities can be set in the ranges of ±2 to ±8 g and ±1.3 to ±8.1 gauss, are available through an I²C interface. 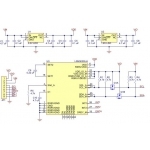 This LSM303 carrier board includes voltage regulators and a level-shifting circuit that allows operation from 2.6 to 5.5 V, and the 0.1" pin spacing makes it easy to use with standard solderless breadboards and 0.1" perfboards. 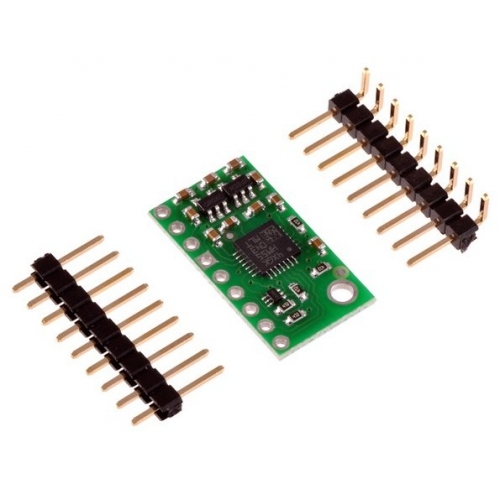 Note: This board is a higher-performance drop-in replacement for the original LSM303DLH 3D compass and accelerometer carrier with voltage regulators. In general, this board can be used interchangeably with the original LSM303DLH version, but note that our original LSM303DLH Arduino library will not fully work with this board (magnetometer Y and Z output registers have been swapped on the LSM303DLM). 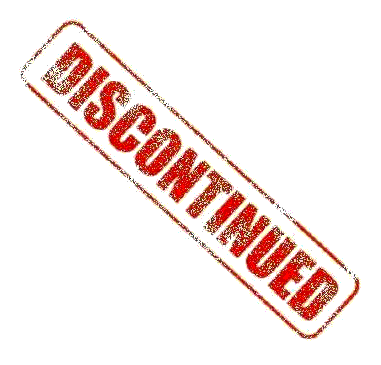 If you were previously using our LSM303DLH library, you should switch to our newer LSM303 library instead, which works with both the DLH and DLM versions. 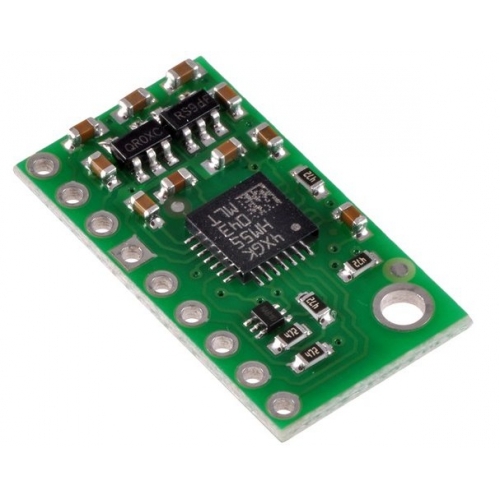 The LSM303 sensor has many configurable options, including dynamically selectable sensitivities for the accelerometer and magnetometer, a choice of output data rates, and two independently-programmable external inertial interrupt pins. The magnetometer and accelerometer can be individually turned on and off to save power, and a special sleep-to-wakeup function allows the accelerometer to sleep until an inertial interrupt is triggered. The six independent magnetic and acceleration readings (sometimes called 6DOF) are available through an I²C/TWI interface and can be used for many applications, including making a tilt-compensated compass that can be used to determine headings regardless of how the board is inclined (ST provides an application note that explains the details of making one). The carrier board includes two voltage regulators that provide the 1.8 V and 3 V required by the LSM303 sensor, which allows sensor to be powered from a single 2.6 – 5.5 V supply. The regulator outputs are available on the 1V8 and 3V pins and can supply almost 150 mA and 300 mA, respectively, to external devices. 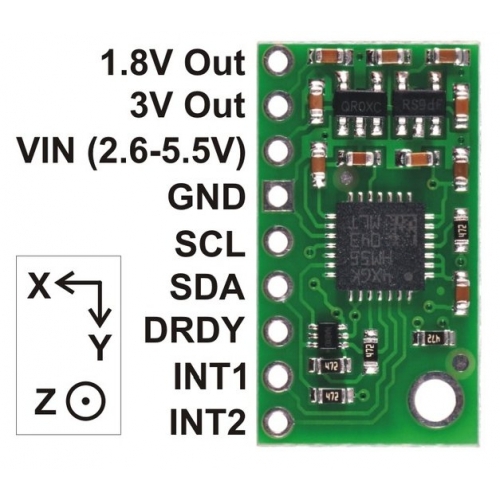 The breakout board also includes a circuit that shifts the I²C clock and data lines to the same logic voltage level as the supplied VIN, making it simple to interface the board with 3.3 V or 5 V systems, and the board’s 0.1" pin spacing makes it easy to use with standard solderless breadboards and 0.1" perfboards. A 9×1 strip of 0.1" header pins and a 9×1 strip of 0.1" right-angle header pins are included. GND The ground (0 V) connection for your power supply. Your I²C control source must also share a common ground with this board if the two do not share the same power supply. 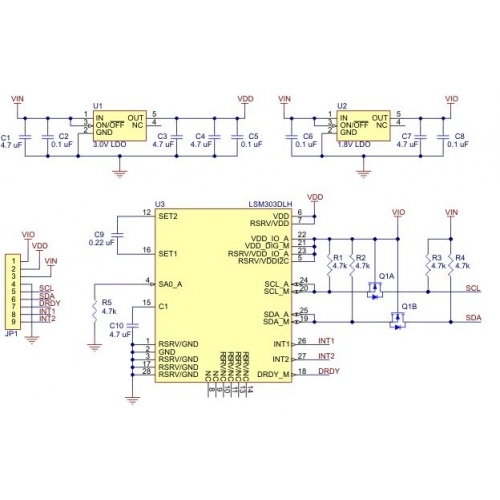 The LSM303DLM readings can be queried and the device can be configured through the I²C bus. The module acts as two chained I²C slave devices, with the accelerometer and magnetometer clock and data lines tied together to the same I²C bus to ease communication. 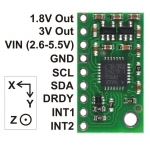 Additionally, level shifters on the I²C clock (SCL) and data lines (SDA) enable I²C communication with microcontrollers operating at the same voltage as VIN (2.6 – 5.5V). 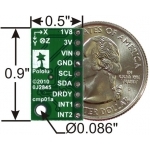 The accelerometer and the magnetometer have separate slave addresses on the I²C bus. The magnetometer’s slave address cannot be changed. The accelerometer’s 7-bit slave address has its least significant bit (LSb) determined by the voltage on the slave address selector pad (SA0_A). The carrier board pulls SA0_A to ground through a 4.7kΩ resistor. If the accelerometer’s selected slave address happens to conflict with some other device on your I²C bus, it is possible to access SA0_A through the untented via on the bottom of the board and pull it up. We have written a basic Arduino library for this LSM303 carrier board that makes it easy to interface this sensor with an Arduino board. 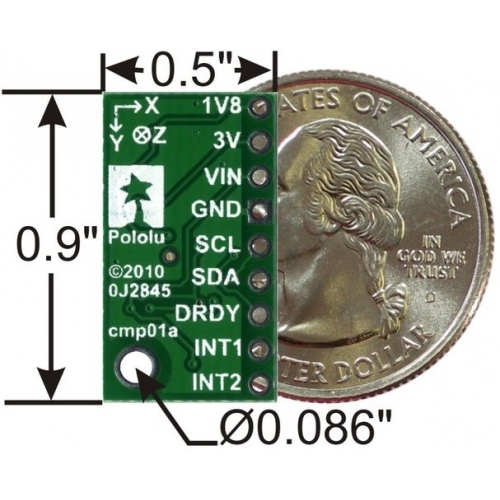 The library makes it simple to read the raw accelerometer and magnetometer data, and it has a function for computing the tilt-compensated heading for those looking to use this sensor as a tilt-compensated compass. We also provide an AVR Studio project that demonstrates how to use an Orangutan robot controller to interface with the LSM303DLM and make a tilt-compensated compass. The project is set up for an ATmega328P microcontroller.